The NAT configuration of a Local with Internet Gateway network in VDC controls how your VMs, which are directly connected only to an internal network, may communicate with the public Internet network. 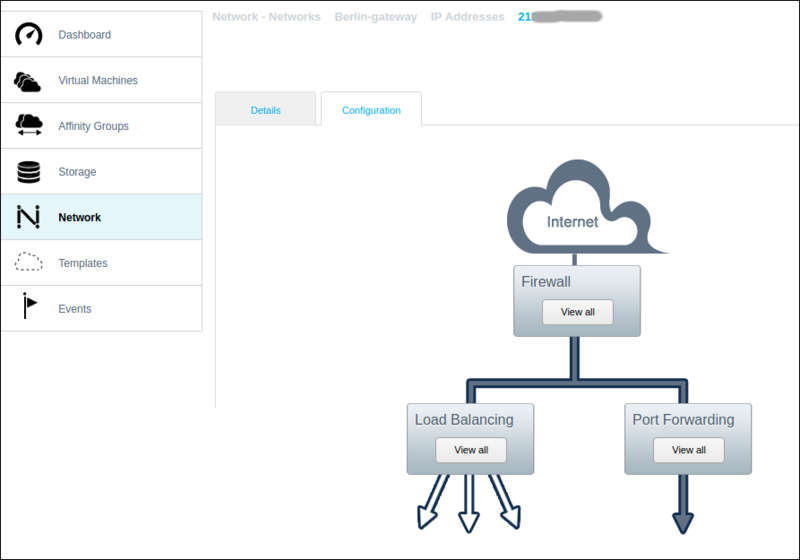 A new 'Local with Internet Gateway' network has no connections (inbound or outbound) set up by default. .The simplest mechanism for controlling inbound connections from the Internet is to use port forwarding rules. Two other mechanisms available are load balancing rules (see How to manage load balancing rules for your VDC), or using a VPN (virtual private network), which creates a connection between your computer and VDC that bypasses the network firewall (see How to enable a software VPN connection to a VM). Remember that you need to create firewall rules for all of the ports for which you are setting port forwarding rules. See How to manage firewall rules for your VDC. Outbound network connections for your VMs are configured using egress rules – see How to allow your VM to access the public Internet network. Port forwarding, load balancing and VPN functions are defined on a type of virtual router with firewall that is built-in to VDC. If you wish instead to deploy a dedicated virtual machine running a firewall application, then you should use a Public Direct Connect network which offers direct connection to the Internet without an additional firewall. The input boxes above the table provide inputs for adding a new port forwarding rule. See below for explanation. The only action for a rule is Delete port forwarding rule ; note there is no confirmation step, the deletion is immediate. You cannot edit the content of a rule, if a change is required you need to delete the current rule and create a new one. Click the Add button. An Add VMs dialog will appear. Use the selection buttons to select the VM for this port forwarding rule. If you have multiple IP addresses for a VM you can select one from the drop-down. Click Apply. The new port forwarding rule should appear in the list, and a 'Task complete' message should pop up. By using different Public Port numbers it is possible to create a set of forwarding rules so that you may use the same public IP address to connect to different VMs. When a network has a second (or more) public IP address, it is possible to connect a VM to the external network using 'static NAT'. Click Network on the left-hand menu to bring up the Network panel. Click the name of a network then click View IP Addresses. Now click Acquire New IP. A dialog will ask you to confirm this. You will now see two (or more) IP addresses for the network. If you click the number of an IP address which is not the 'Source NAT', then its Details sub-panel will appear with a button to Enable Static NAT . If you click the button then a dialog will appear with the list of VMs that are attached to this network. Use a radio button to select one. Click Apply to complete the static NAT setup. Remember that firewalls in VDC default to 'deny all', so to make this new network connection usable you need to create firewall rules. See How to manage firewall rules for your VDC.